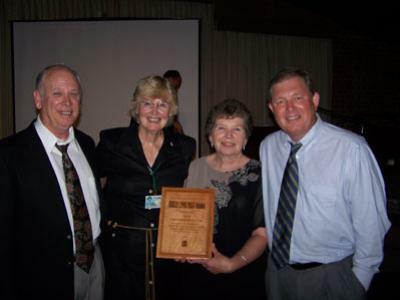 At its 2007 annual conference, the National Association of State Park Directors presented its President's Award to the Virginia Association for Parks. 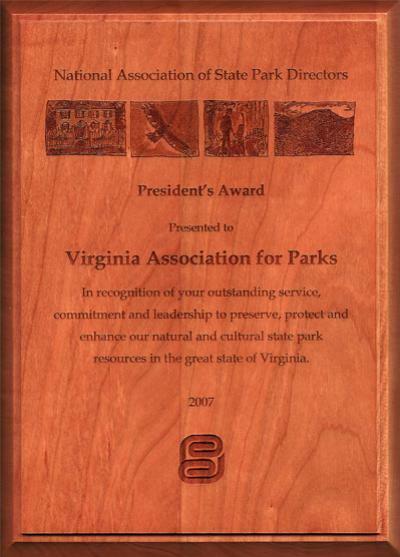 "Presented to Virginia Association for Parks. In recognition of your outstanding service, Commitment and leadership to preserve, protect and enhance our natural and cultural state park resources in the great state of Virginia. 2007"
In accepting the award, Johnny Finch, VAFP President, commented that 2007 is VAFP's 10th anniversary and that for VAFP to receive such a prestigious award in its relatively short organizational life is really meaningful and very much appreciated. Finch asked all VAFP members and other volunteers present at the awards ceremony to stand and share in the moment. He then, on behalf of park volunteers across the Commonwealth, both accepted the award and thanked the NASPD for the great honor.